Black and white photograph of a man and a woman in a car during an anti-busing motorcade to Washington, D.C. 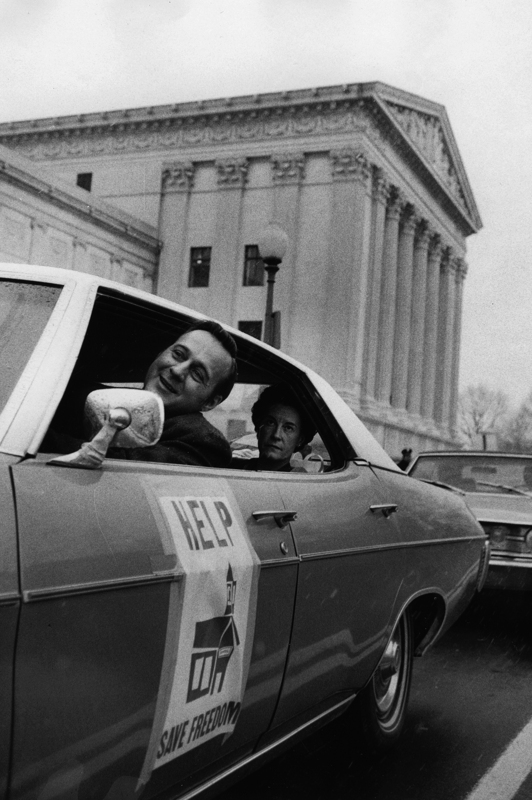 The car is driving past the U.S. Supreme Court building and has a poster taped to the driver's side door of the car. The poster is of "The Little Red School House" with the words, "Help / Save Freedom." The man leans his head out the window and smiles. On February 17, 1972, nearly 3,300 cars traveled in a motorcade from Richmond, Virginia to Washington, DC. Despite snow, the protesters made a symbolic journey to Capitol Hill to voice their opposition to Judge Robert Merihge's ruling (Bradley v. School Board of City of Richmond, Virginia) that public schools in Richmond, Henrico County, and Chesterfield County must be consolidated. At that time, Richmond public schools were 70 percent black while those of the two counties were about 90 per cent white. Cars in the motorcade carried red and white signs reading “Help Save Freedom” and imprinted with a picture of a little red schoolhouse. Richmond Newspapers, Inc. , “Anti-School Busing Protest, February 1972,” Social Welfare History Image Portal, accessed April 26, 2019, https://images.socialwelfare.library.vcu.edu/items/show/286.